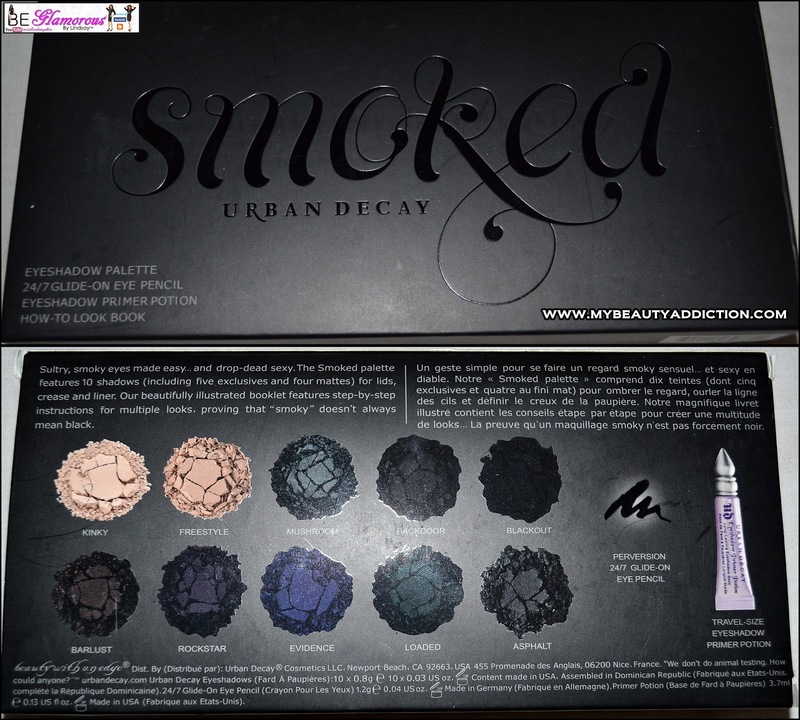 Today I tried out the Urban Decay SMOKED palette from MY BEAUTY ADDICTION. On the website it states that this is a replica item, but it was extremely hard to tell the difference. The quality is definately there and you get a lot out of this kit for the great price of only $28. These 10 shadows are 4 mattes and 6 shimmer shades. 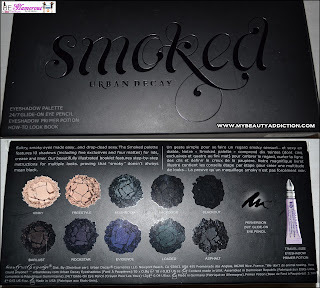 This palette can give you a huge variety of smoked looks. The shades are wonderful alone or blend well together no matter which shades you put chose. I swatched each shade using the enclosed Primer Potion as the base. The base itself is wonderful and well-loved by many makeup artists and tends to be a must-have primer. I really like the squeezed tube. The color of the primer is a skin tone and blends so easily. Each shade was swatched using my finger with just one swipe. The shades can be darker by layering the color. I was pleasantly surprised how pigmenented and vibrant they are. ALL equally GORGEOUS! The eye pencil Perversion that came with the palette was also a wonderful pencil. I've tried so many pencils and this is probably the best pencil I have ever touched. I love the pointy tip and the color wasn't overly black. without making those 'racoon' eyes, that most pencils tend to give. This is my look using this palette, I went for a softer smoked look today. I used the pencil as well. Overall I love this palette and everything that came with it. It's a great product! Please check out the website for this product and other amazing products. Have a Glamorous Day and Thank you for stopping by!